Rory Feldman and Gabe Fajuri. Edd Patterson takes a tour of the Thurston display. 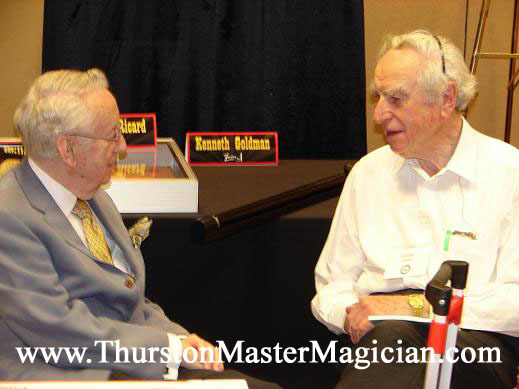 Rory Feldman and Eddie Dawes discuss Thurston and the Museum of Magic. Rory Feldman, Amy Dawes, and Eddie Dawes. Bjorn Hanson and Rory Feldman. Stanley Palm, Rory Feldman, Chris Woodward, and Nadine Woodward talk about the Museum of Magic. Chris Woodward, Nadine Woodward, and Rory Feldman. Roger Dreyer, Nadine Woodward, Rory Feldman, Chris Woodward, and Peter Lane. David Stahl looks at the "Do The Spirits Live?" poster. Andrew Pinard and Rory Feldman. A special thanks to Andrew for working so hard on the Yankee Gathering book! Andrew Pinard and Rory Feldman look at the Perfect Breather display. Nelson Nicholson stopped by the Thurston display and looked through the Thurston Magic Box of Candy portfolio. Blackstone's "Elusive Moth" Adele Friel Rhindress and Rory Feldman. Blackstone's "Elusive Moth" Adele Friel Rhindress and Morgan Feldman. Gary Hunt and Rory Feldman. Mario Carrandi and Rory Feldman. Blackstone's "Elusive Moth" Adele Friel Rhindress and Mario Carrandi. Stanley Palm and Rory Feldman. 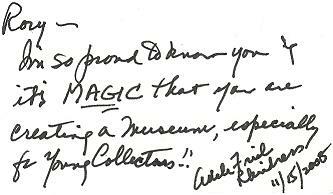 Blackstone's "Elusive Moth" Adele Friel Rhindress signing the Museum of Magic's mailing list and a card for Rory Feldman. The card signed by Blackstone's "Elusive Moth" Adele Friel Rhindress. Blackstone's "Elusive Moth" Adele Friel Rhindress and Stanley Palm. Stanley Palm and Chris Woodward. Dr. Cato Holler, Susan Holler, and Rory Feldman. Morgan Feldman, Donna Patterson, and Rory Feldman. Edd Patterson and daughter Donna Patterson. Rory Feldman, Donna Patterson, and Edd Patterson. Jim Rawlins and Rory Feldman. Rory Feldman and Sean Owens. Meir Yedid and Rory Feldman. Rory Feldman and Ray Goulet. William V. Rauscher and Rory Feldman. (from left to right) Rory Feldman, Paul Mayer, William V. Rauscher, David Haversat, and Morgan Feldman (aka known as the Chateau crew), standing together in front of the Thurston display. Thanks to Paul Mayer for helping out so much and for the great signs he made! Thanks to William V. Rauscher for all of his input on the Thurston display and for writing the article "Feldman Presents Thurston". Also, a congratulations to William V. Rauscher for the success on his great lecture on Neff called "Pleasant Nightmares". Thank you so Dave Haversat for all of his work putting together an amazing exhibit room this year. And thank you to Morgan Feldman for all of his help and support setting up the Thurston display! Harry Houdini's great-grand-nephew John Hinson and Rory Feldman pointing at Houdini and Thurston in the photo. Morgan Feldman (left) and brother Rory Feldman (right) together after the banquet in front of the Thurston display. The display could not have been possible without the help and support of Morgan Feldman. A special thank you to Morgan! William V. Rauscher and Eddie Dawes. Rory Feldman, William V. Rauscher, and Eddie Dawes.